​Conspiracy theories can be tremendously harmful to society and the marketplace of ideas. Alternatively, they can be harmlessly amusing. This one is neither of those-- in fact, I have no idea what to make of it. But in the wake of Nets wing ​Caris LeVert's devastating lower leg injury Monday night, this one is worth pondering. Did you know that Derrick Rose was on the court not just for this one, but also for Gordon Hayward's horrible season-ender last year for the Celtics? Or that he was also out there for Team USA when Paul George went down in gruesome fashion in 2014? This is absolutely eerie. 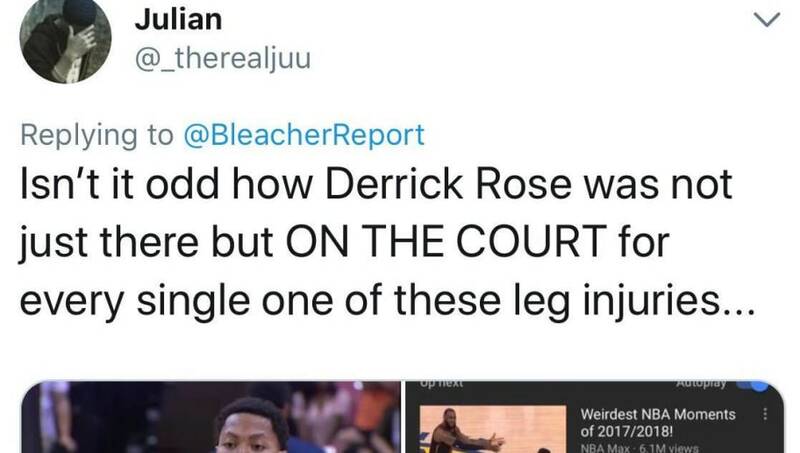 Nobody here is suggesting that Derrick Rose is some kind of Angel of Death, but the situation poses some intriguing questions-- and uncomfortable ones. In the big picture, what really matters is that LeVert is okay and that he can get himself on the road to recovery. Anything else right now ought to be shoved to the periphery. But it's downright bizarre that D-Rose can say this for himself. It's practically paranormal. And it would be nice to be assured that this really was all simply random chance and not some unknown and nefarious force at work.